It’s coming. He knows it is. It’s only a matter of time before it buries him. His story is not unique. It’s been played out in our industry over and over again. He’s suffering from BUAMODS – or – Buried Under A Mountain Of Data Syndrome. But what’s the cure for this ailment? How do we dig ourselves out from underneath this mountain of analytics? 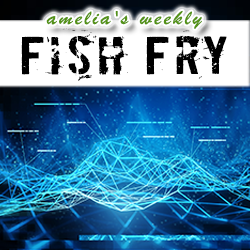 In this week’s episode of Fish Fry, we strike at the very heart of this issue. Dr David Fried (CTO – Coventor) joins us to discuss how big analytics are changing the course of the semiconductor industry. We talk about the value of process variant experiments and how process modeling will affect the future of advanced 3-D technologies. Also this week, we check out a new 3-D prototype chip from MIT and Stanford University that combines data storage and computing in a single chip with a little help from multiple nanotechnologies. New Episode of Chalk Talk: Diodes or Multilayer Varistors?